What’s with all those pasta shapes? Looking on the shelves of the supermarket, the range of different shapes and colors of pasta can be really overwhelming. 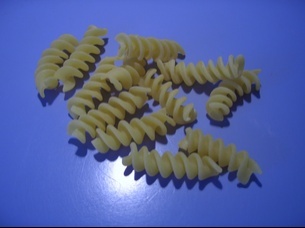 With over 500 different types of pasta available, it is one of the most popular foods in the world today. It is incredibly versatile and can be served in a ton of different ways. You can buy pasta dried and in packets from the supermarket. Many supermarkets and specialty stores also sell fresh and frozen pasta. 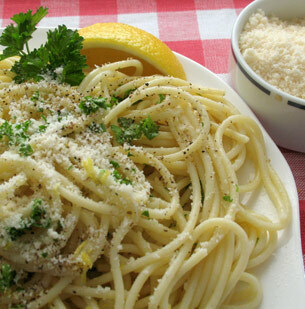 Pasta: Dry, Fresh or Frozen has some great tips on helping you to decide what to buy. Which pasta with which sauce? …and linguine – needs lots of lubrication, so they work best with olive-oil-based sauces which coat the pasta completely without drowning it. 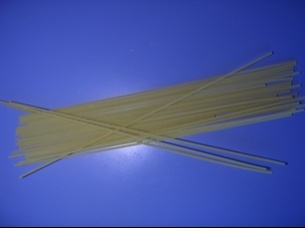 When cutting vegetables or herbs for long pasta, cut them string-like (also called julienne or match stick) rather than in cubes to help them blend better. …go well with sauces that are thick or chunky. 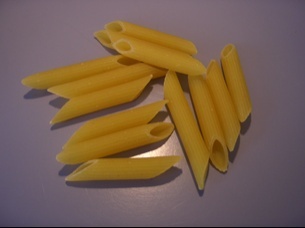 Keep the size of the ingredients in mind: tiny macaroni won’t hold a chickpea, while rigatoni may feel too large for a simple tomato sauce, where penne would work better. Ridged pastas provide even more texture for sauces to cling to. There is really only one type of broad, flat pasta used for baking in the oven (al forno) and that is lasagna. These sheets are designed to be baked between layers of sauce in the oven. 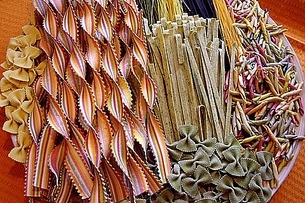 Archimedes’ Laboratory has colorful drawings of just about every imaginable shape of pasta. I am learning something new everyday about cooking. How did I ever get along up to now in my kitchen? 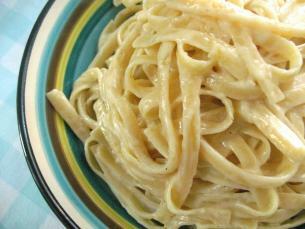 Love the blog about pasta, one of my favorite foods. Son much information, as you would say Who knew? Hi Kathy, thanks for visiting my site. i wanted to return the nice gesture of you leaving a comment and i love your pasta article. I’m Italian but still feel like i know NOTHING about all the pastas. I’ve just added your site as a favorite AND that other page you directed us to with all the pictures. I love it! my favorite is cavatelli. mmmm!! Hi Mona, Welcome to startcooking! We get to NYC several times a year. I now know where to look for great restaurants recommendations. Cheers! My favourite pasta dish is from ‘Real Fast Food’ by Nigel Slater, an English food writer. His book has good recipes that take less than 30 minutes. The dish combines penne or any shell-shape pasta with a sauce of chopped olives, anchovies, mushrooms, garlic and parsley. It’s fantastic and EASY. I’ll bring you a copy of Real Fast Food when see you in March. Hi (cousin) Shelia! Welcome to my blog! Thanks for jumping in. I love being introduced to new cookbooks. This one sounds like a real find. I love the idea of fast food that actually tastes good and is fast to make. Nothing better than a personal recommendation! Great idea Dave! It sounds easy and delicious! What type of macroni do you use to make macroni pudding? Hi Charlene, I’m not sure I understand what you mean by “macroni pudding”? I love lasagna and pie! Hi Bob, I’ve done a Lasagna (video) and both pumpkin and peacan pie! Enjoy! 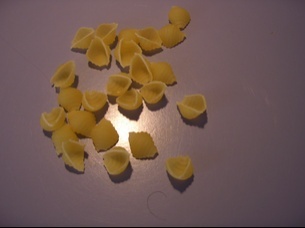 One of the considerations in picking the appropriate pasta is surface area. For instance, if you’re making a pasta salad, chances are the dressing is going to be a bit thin. 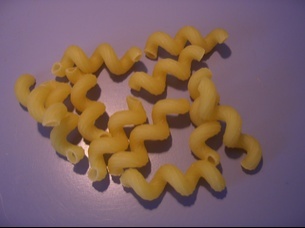 So, you want a pasta that has a lot of surface area, such as a rotini or fusili. 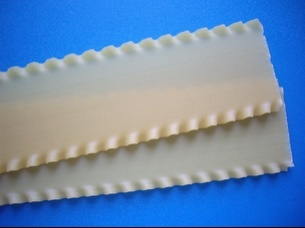 The noodles look small, relative to say lasagne noodles, but all those nooks and crannies add up to a lot of surface which all holds a coating. Another thing to think about is structure and texture. You wouldn’t want to build a lasagne out of macaroni noodles. It would be tough to layer, and tough to meter out servings. And if you want something meaty under a bold sauce, the heaviness of a penne or rigatoni is a good choice. The rest of the fanciful shapes I think are more marketing tricks than anything else. But, a great deal of eating happens with the eyes, so a fancy appearance can be a Good Thing. we hav to make a dessert out of pasta. so i wanted to make kataifi, but i want to know if pastry is basicly the same as pasta? At their very roots, pastas, pastries, and breads are all the same thing – flour. The difference is pasta is basically flour and water, pastry is basically flour and fat/oil, and breads/cakes add yeast and sugar to make bubbles so they’re fluffy. How they’re handled is different, and of course there may be other ingredients. But, for school, they may not be willing to let you split hairs about what something “basically” is. So, for an interesting pasta dessert, how about this Orange Pasta? Cherize, if you Google “dessert pasta” there are about 1/2 million recipes to choose from. I recently saw on the Food Network a recipe for Chocolate Hazelnut Ravioli which looked really great -it was made from won ton skins. KGW’s recipe link to Orange Pasta looks terrific! You are so right Nelly! Have you tried my Chicken Noodle Soup yet? You would be surprised at how quick and easy it is to make and it has lots of pasta noodles in it! Can anyone tell me where I can buy Kataifi? I hae searched all supermarkets and cant find it and wonder if it goes by a different name?? Kataifi is a form of shredded phyllo dough peculiar to the middle east, so you’d probably have to find a middle eastern bakery to get it. But, you might be able to use phyllo dough, depending on the recipe. You can read about phyllo here and judge for yourself. Also, it may be called other things, such as Kanafeh, kadayıf, kadaif, kataifi, or kadaifi. Thanks KGW! I have never heard the term Kataifi. No problem. I’ve only heard of it because we happen to have one of the largest concentrations of mid-eastern immigrants in the world not far from here in Dearborn, MI. Something like 350,000 of them now call it home, and it’s what you might imagine Bagdad would look like if it cleaned up and caught up to the 21st century. It’s pretty bizarre, actually. A lot of the women still wear the traditional full-cover clothing, veils and all, and everywhere you go all you hear is Farsi. Kathy– I love startcooking.com! I use it to teach my Girl Scout troop (Juniors, grades 4-5) how to cook. Each month we tackle a new topic. We’ve done eggs and potatoes so far this year. This month its going to be pasta. Your site puts the information forth so simply and accurately, it makes teaching the girls a breeze! Thank you!